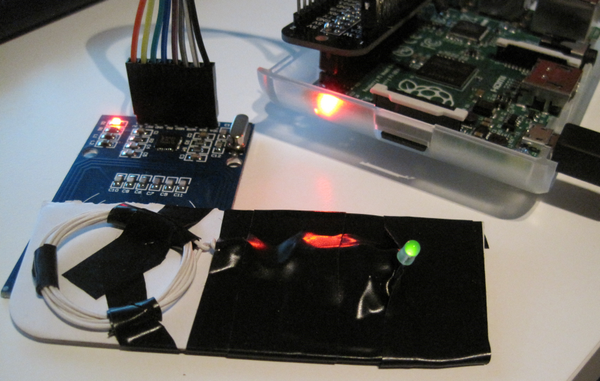 Triggered by experience with “Raspberry and RFID reader/writer, first test “, I tested a simple LED RF detector idea that can be found in “RFID detector” and “RFID Reader Detector and Tilt-Sensitive RFID Tag “. The components are connected in parallel. 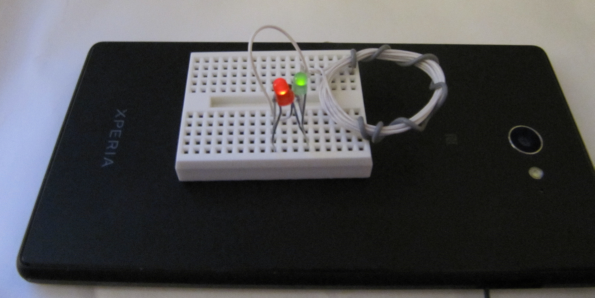 The LC circuit has a resonance peak around 13 MHz and can drain enough power from the RFID/NFC reader to light the LED. 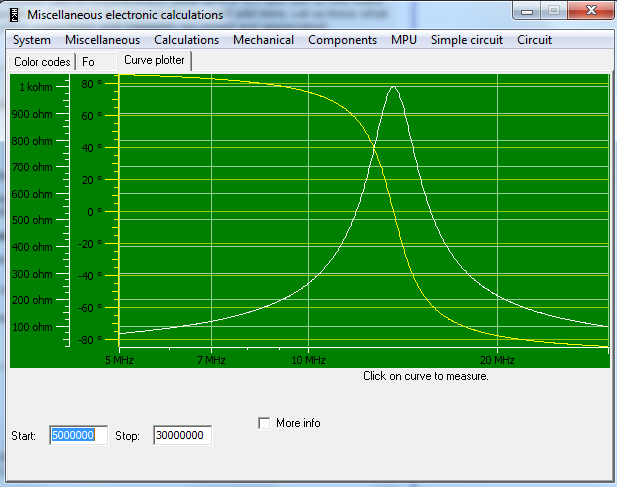 For simplicity, there is no resistor in the circuit that would limit the maximum current through the LED. 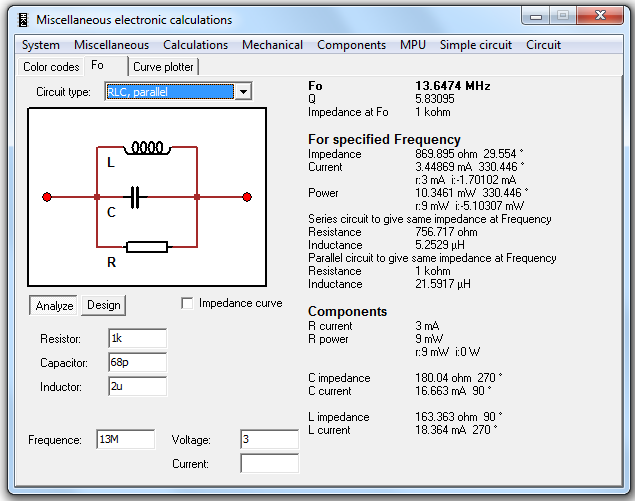 The currents are so small that the resistor is not needed. 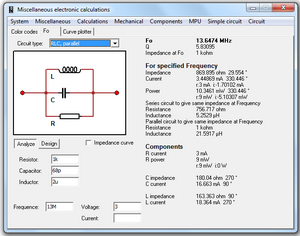 The figure below is made with the Fritzing tool . The inductive coil of 2uH can be made by 7 loops of 25mm diameter. A functioning example is shown below. Capasitor is under the tape. The LED turns on around 15-20 mm above the RFID reader. The figure below shows a slight modification, where 2nd LED is added to the circuit. The 2nd LED is also parallel connected but with opposite direction than the 1st LED. 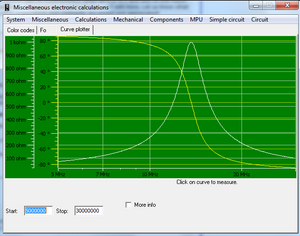 One can use the portable MiscEl tool to see the impact if the L or C values are changed. The screenshots below are for the used values L=2uH and C=68pF. This entry was posted in DIY, For Fun or Interest, Gadgets, Hobbies and Other Interests, Internet of Things and M2M, Raspberry Pi, Recommended Free Tools, Tests. Bookmark the permalink.